Snow covered Red Square and the Spasskaya Tower after a snowstorm in Moscow, Russia, Feb. 5, 2018. 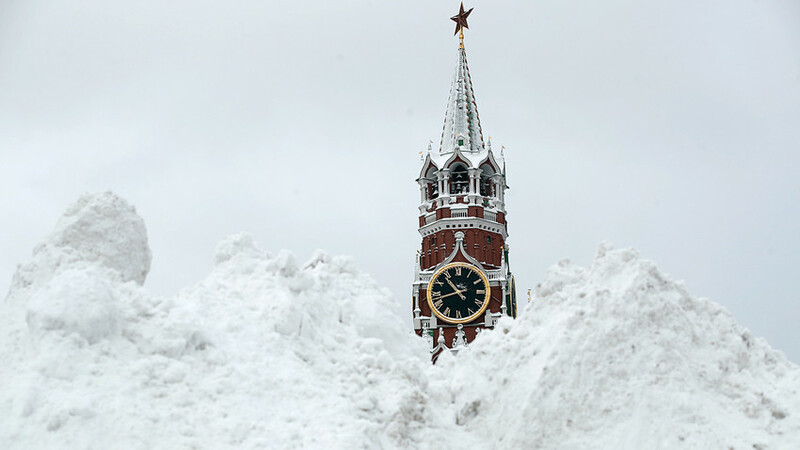 Severe snow and freezing rain hit Moscow this weekend. The city authorities called it the heaviest in the last 100 years. While the traffic in the city is gridlocked, locals try to get to work by train, walking, and even by skiing. Cannot find your car under the snow? It’s time to take your skis from the balcony! The snowboarding season has finally opened in Moscow! In Moscow’s suburbs residents filled up entrances to the offices of the utility company with snow because they didn’t clean yards and sidewalks - revenge is best served cold! Many drivers literally lost their cars in the snow. On a positive note, it’s a perfect time for some exercise - with a shovel. It’s very dangerous on Moscow’s roads now as the trees are falling under the weight of the snow. The city authorities asked drivers to leave their cars at home and use public transport instead. Many people followed the advice. Leaving cars behind did not make life any easier for Muscovites. These passengers had to push their way through the snow. Dozens of electric trains were delayed because of the snow. Passengers had to be patient. A major transportation meltdown happened in Moscow airports. Some incoming flights had to be diverted while those ready fly from Moscow were forced to wait for hours. “When you need to depart urgently… but it keeps snowing and you sit and wait for your flight for nine hours and for all those nine hours you hear one thing: The flight is delayed, the flight is cancelled…,” posted Instagram user @serenkook. Airport services kept fighting the elements but nature gave them no chance. Mountains of snow surrounded planes in Vnukovo Airport in Moscow. Sheremetyevo was snowstruck as well. More than 350 trees have fallen in Moscow. Some local residents were injured. Moscow mayor Sergey Sobyanin said school was optional over the coming days. Finally some good news! Animals had their own troubles in the snow. The snow transformed the city beyond recognition. There was so much of snow that some of the capital’s landmark were given a makeover. Even Red Square was buried in snow. Brave Muscovites and tourists did not succumb to the elements though. Persistent explorers discovered amazing views. The art of snowy Moscow.